Arnold is an advanced Monte Carlo ray tracing renderer built for the demands of feature-length animation and visual effects. Originally co-developed with Sony Pictures Imageworks and now their main renderer, Arnold is used at over 300 studios worldwide including ILM, Framestore, MPC, The Mill and Digic Pictures. Arnold was the primary renderer on dozens of films from Monster House and Cloudy with a Chance of Meatballs to Pacific Rim and Gravity. It is available as a standalone renderer on Linux, Windows and Mac OS X, with plug-ins for Maya, Softimage, Houdini, Cinema 4D and Katana. 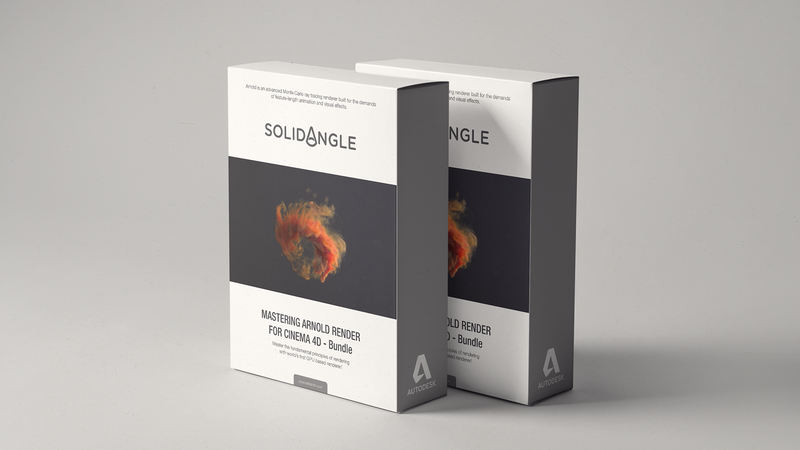 “Mastering Arnold Renderer for Cinema 4D” is a collection of short, educational video lessons that feature Solid Angle’s global illumination rendering engine. With a total length of 6 hours, this course is all about key concepts that will help get you started working with this highly efficient, physically-based ray tracer. Buying the Bundle saves 25$! Still not convinced? Check out what fellow 3D artists have to say about it! InlifeThrill has done a tremendous job at clearly and visually explaining how Arnold for Cinema 4D works. There are tips and techniques useful for both novice and expert users. I am impressed by the quality of this material. “Mastering Arnold Renderer for Cinema 4D” is a comprehensive and professional collection of tutorials, covering many crucial features of this advanced renderer and how it integrates into your C4D workflow. If you use Arnold, this really is essential training. “Mastering Arnold for C4D” is clear and concise, showing every major feature of the plugin with practical examples. Not only is it a great introduction to a great render engine, but I plan to use it as a reference guide when I need to know a shader or a workflow in more detail. It’s absolutely impressive how deep this mastering course is! I highly recommend it. This course will help people who just started digging into Arnold as well as experts who want to improve and learn a lot of tips. Dobs dives into Arnold for Cinema 4D very deep and covers the usage from install to final comp. If you want to learn how to use Arnold for Cinema 4D on a professional level, these well designed, straight forward tutorials are a perfect for you! Browsing a tutorial Dobromir Dyankov is like browsing a bedside book. As usual, the software has been addressed remarkably! It does not only teach us but makes us want to go further. It combines the useful and the beautiful, like an artbook which we never parted. “Mastering C4DtoA” will literally make you a “Master” of C4DtoA. Pretty much everything there is to know about the Arnold renderer inside Cinema 4D has now been covered in this series.. and then some. Overall, one of the best tutorial series I have ever had the pleasure to watch. Dobromir’s easy to understand and well explained lessons will get you up to speed with one of the best production renderers out there, in no time. “Mastering Arnold Renderer for Cinema 4D” not only covers the basics but gives you in depth info over the huge functionality of Arnold. If you want get started or already using C4DtoA its well worth a look! “Mastering Arnold Renderer for Cinema 4D” defines the de facto standard compendium for the ambitious C4D user eager to comprehend the vast featureset C4DtoA offers. Dobromir covers everything from basic usage to sophisticated and complex workflows, yet keeps always working on useful and appealing examples. Absolutely recommended for every C4DtoA user from novice to pro! This is a really great series for anyone looking to get a deeper understanding of Arnold. Almost like a video reference manual, Dobromir has broken up each part into smaller chunks, which makes it easy to learn from the start or dip into specific areas you are interested in. The videos are short but detailed with great looking example projects to demonstrate the concepts. From the simplest settings to more advanced subjects such as OpenVDB, Arnold procedurals, AOVs, Hair and Particles, I would recommend this to anyone looking to learn more about this renderer. Besides of an impressively deep and well explained guide into the powerful Arnold Renderer, InlifeThrill spiced up this learning series with a ton of beautiful scenes and useful tips for Cinema4D. A must-have for every C4DtoA artist! This is the most complete visual guide to C4DtoA available. Nothing is left out. The easy to follow examples on every aspect of C4DtoA makes highly advanced workflows available to Artists, wanting to move to a production strength renderer. InlifeThrill offers the ultimate entry into the world of Arnold for C4D. The “Mastering C4DtoA” bundle gives not just beginners a very detailed overview about all the main features of this powerful renderer for C4D. Can´t wait to increase my knowledge and I´m happy that now something like THE video reference book for Arnold exist. Oh, and the more than fair price is a nobrainer! Of all the Arnold for Cinema 4D training out there, “Mastering C4DtoA” is by far the most comprehensive, enjoyable and engaging. It’s very well laid out, so you can watch all 6 hours from start to finish, or just pick out the specific content you need. This isn’t just video training, this is an invaluable C4DtoA visual library and it’s worth every cent, and then some! A must have for anyone wishing to learn the beautiful Arnold renderer.